Ji Tong 乩童 (aka Tong Ji 童乩 or Tang-ki in Taiwanese), is a rarely seen event of old Taiwanese religious belief. It’s a type of shamanism, where the “spirit-medium” human is possessed by the spirit of a god. After doing so, the god can live for a short while in the body of the medium to prove his existence or even answer questions to the benefit of believers. The more visually interesting aspect of Ji Tong is when the gods take possession at a temple festival. That’s when the spirit-medium often starts self-flagellating himself with spiked bats, swords, and other medieval pain and blood inflicting devices. Everyone I’ve talked to about this, has had very little information for me. 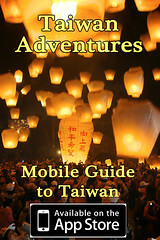 It seems that many Taiwanese don’t believe it, and even fewer know anything about it. Even inquiring about it at local temples, people don’t know much, and never seem to know when the next event will happen. So, finding a ceremony with people practicing Ji Tong just seems to be something you have to be lucky to find. This was the first time I’ve seen it in over 8 years of living in Taiwan. 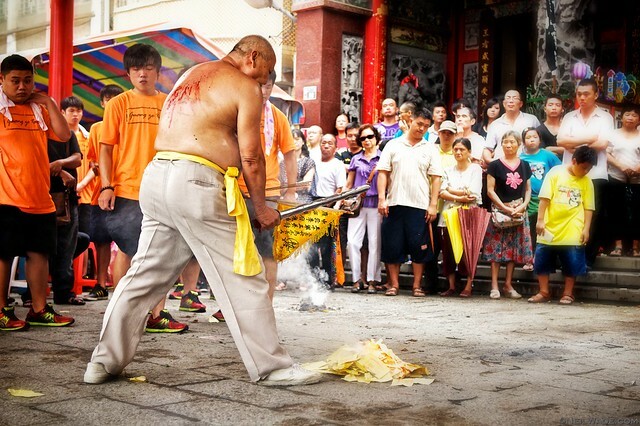 This man is performing a Ji Tong ritual. The spirit-medium, said to be possessed by the spirit of a Taoist God, self-flagellates at a religious ceremony in Tainan, Taiwan. The blood on his back is from repeated blows from various sharp weapons.